The prom is a special moment in every girl’s life. Purchasing an arm, or wrist, corsage from a florist is quite expensive. Making the small floral arrangement yourself is quite easy. You certainly can use fresh flowers, but if you do, be sure to make the corsage as close to the event as possible so they will be fresh. The use of silk or other artificial flowers allows you to create the corsage ahead of time. Pick a single bloom for the focal point of the arm corsage. Choose three buds or smaller flowers with leaves. Fresh flowers are most often purchased at florists, but don’t discount the money you can save by purchasing fresh flowers from the grocery store or picking them out of your garden. Silk flowers are found at big box stores or generally anywhere crafts are sold. Loop the ribbon, back and forth, in a 4-inch length. Wrap and twist a short length of wire around the center of the ribbon loops. 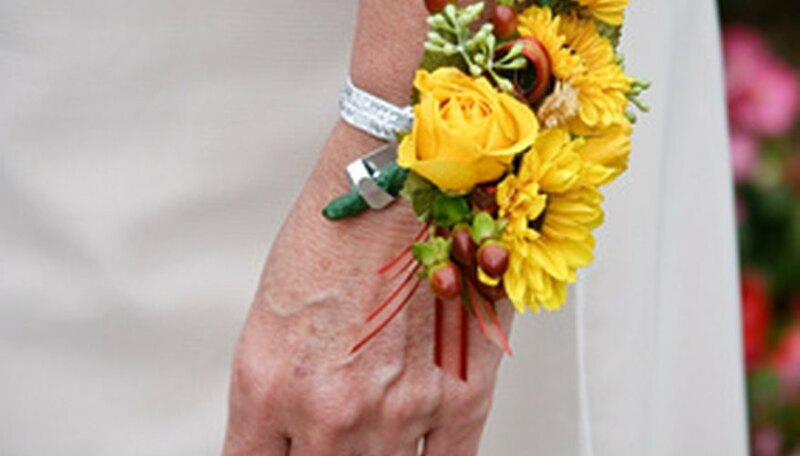 Attach the wire to the center of the metal prongs on the corsage wristband. Fan out the loops of the ribbon. This bow-shape is the base of the corsage. Cut the leaf sprays from the flower stems. Glue them in a fan shape, over the ribbon on the corsage band. Cut the flower buds, or smaller flowers, to fit over the leaves. Place them far enough out so that the large focal flower will only cover the stems. Glue them down and let it dry. Wrap the florist wire around the ribbon, leaves and buds, through the metal base of the prongs. Cut the stem on the focal flower about an inch from the bottom of the bloom. Pull the wristband metal prongs over the flower stem with the needle nose pliers. Arrange the flowers as your work so that the prongs are hidden. All items need to create an arm corsage are found online or at craft stores. Add other items, such as beads, tulle, additional ribbon or even more flowers, if you desire. Keep fresh flower corsages in plastic containers in the refrigerator until they are ready to be worn.